In 1995, the year my father died, the eighth candle of Hanukkah fell on December 25th. I could not have been more relieved. Though my father had died months earlier, as the December holidays closed in I was feeling increasingly anxious and ambivalent. How would I, could I, do Christmas without my father? For me, Christmas revolved around Dad. Of course, my mother did all the baking, all the cooking, as well as the bulk of the shopping. But everything was orchestrated by Dad. The tree, the decorations, the annual four-letter-word-enhanced battle with the strings of lights, which would devolve each year into a massive tangle in their box. The music on the phonograph—from early morning gospel (despite Dad’s atheism) to Handel in the afternoon, to late night Louis Armstrong. It was all Dad. Who was, after all, the child of Christians—real ones. For whom Christmas was not about gift-giving and shopping and cookies and sweeping up glass because the damn cat got into the tree again. No. Christmas, for my paternal grandparents, was about the guy himself. Jesus. It was His Day. And for my grandmother—who died long before I was born—this involved Church. And cooking and gifts and keeping the dog out of the tree. But first and foremost Jesus. So with Dad around, I could embrace Christmas for what it was to my family. An annual tradition of sharing—gifts, music and food. Inviting loved-ones from around the area, telephoning loved-ones too far-flung to see in person. Taking the time to pause and love one another. My mother participated wholeheartedly. Being Jewish was her history, her family background, but not about religious affiliation. Besides, there was nothing in my family’s “Christmas” traditions that went against Jewish culture or values. (See above: love, food, music, sharing.) My parents had co-created a unique family culture during their long marriage and Christmas—Williamson-style—was just part of it. We did Hanukkah too—there was a Menorah, dreidel, chocolate gelt and actual gelt coins which came tucked in little pockets of specially designed cards. And of course, latkes. It starts for little kids in school. In planning the Holiday art project. Children are asked—not are you Jewish?—but which does your family celebrate, Christmas or Hanukkah? (Now, they are including Kwanzaa and Ramadan, but they didn’t even when my children were little.) The teachers just want to know how many trees to cut out, how many Menorahs. But what is created is a false sense of balance. They have Christmas; we have Hanukkah. So it’s fair. But the analogy is half-baked. Hanukkah is not as to Jews as Christmas is to Christians. We have our High Holy Days and Hanukkah is not one of them. Instead, it is a beautiful holiday commemorating a miracle, celebrating freedom. But this mini-rant wasn’t the point of my post. The point was Christmas 1995—my first without Dad—and the coinciding last night of Hanukkah. 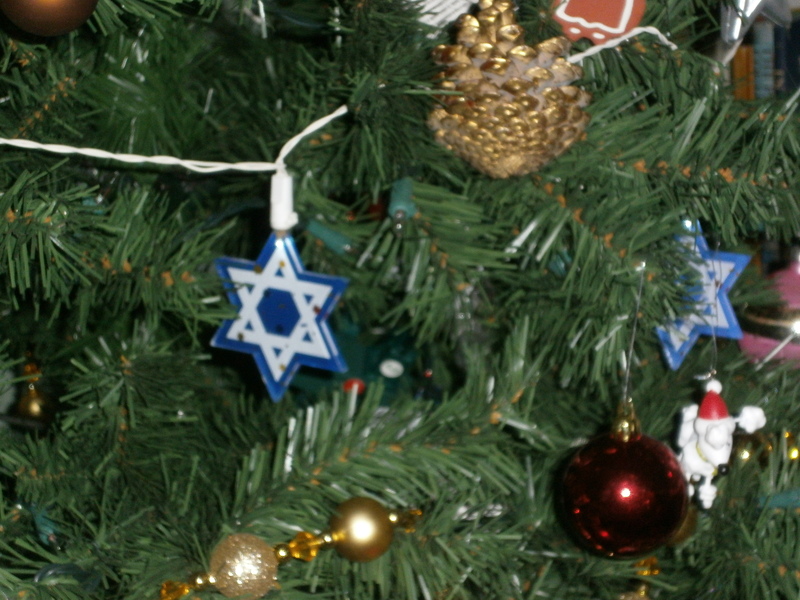 For some time, I had been struggling to justify celebrating Christmas as a Jewish person. What right had I? On the other hand, as a person of color, constantly questioned about my claim to Jewishness*, how could I call myself a Jew if I grew up celebrating Christmas anyway? Clearly, the problem was celebrating Christmas itself. If I took that off the table, I’d have nothing to explain, nothing to justify. So how convenient was the timing of that eighth candle? I think it was a relief to my mother also, not to have to recreate the Williamson Christmas without Dad at the helm. It would have been too sad. Too soon. What we did instead was throw a big, beautiful latke party. We invited all the friends of the family who used to join us at Christmas—most of whom were Jewish anyway. There were about three or four Hanukkiahs but no Christmas tree. There was loads of food and plenty of music—klezmer, Jewish folk songs, Hanukkah, Oh Hanukkah!, Tzena, Tzena, Tzena! As well as some Louis Armstrong thrown in for good measure. It was a wonderful, healing night. And for me, it was a send-off to Christmas itself. My father was gone. I had new traditions to make. Christmas was part of my past. It was time to say goodbye. Things went on smoothly from here. I got married to Jon, who was Jewish—more culturally than religiously, like me. We celebrated the Jewish holidays with family in a low key sort of way, ate Chinese food on Christmas, took it as a given that our future children would do the same. We’d explain Christmas the way many Jewish families do—as a holiday for others. I didn’t miss Christmas; neither would they. As American conspicuous consumers, we’d make fanfare and share gifts for Hanukkah. And so we did, until our children were one and three. Something changed my mind. No, it wasn’t a visitation from some spirit of Christmases past. It was a shopping mall, frankly. One of those spectacularly American, sprawling malls, where you can buy everything from fine furs to motor oil. I went to this mall with a friend—another mother of two, who was there to do her Christmas shopping. It wasn’t any of that. But it was sort of all of it. All around me—as far as the eye could see—was stuff my dad would have poked gleeful fun at. The cartoonish decorations, the over-the-top promotions, the music, the urgency in the eyes of the shoppers (acquisition as a competitive sport! ), the music, the clawing one’s neighbor for a spot in line to see Santa, the absurdity of the whole thing, would have just tickled my dad to pieces. As I walked through it all, pushing my son in the stroller, checking occasionally to make sure my daughter was holding on tight, I found myself flashing back. I’m five or so, Christmas shopping with Dad, heading for Gimbels on East 86th Street, to buy my mother a present. Normally I love Gimbels because of the lights and colorful scarves and exotic smells of perfume, but today I am frightened because of the men in red suits who guard all four entrances. They have white hair and beards and say Ho-Ho-Ho in a deep, throaty growl. When we get close to one of them, I begin to scream and refuse to take a step further. My father is used to this. Each year, he and my mother assuage my fear of Santa Claus by assuring me that he is only pretend. Well, this guy looks pretty real to me. My father slips guy a five dollar bill to make himself scarce long enough to get me into the building. Inside there are no more scary men, just beautiful things to see and touch and smell. At home, my mother is baking gingerbread men that I will decorate later. Then I will fasten my special family of paper birds with wire feet to the lower branches of our Christmas tree. All these years later, pushing a stroller through a mall in New Jersey, it occurs to me that I still have that family of birds—or my mother does—somewhere in a box, wrapped in tissue along with the other decorations from my childhood. And it also occurs to me that maybe—regardless of my religion or lack thereof—these birds and the traditions that went with them are still part of me. And part of my children’s birthright. So, before I left the mall, I bought my children each a painted wooden Christmas ornament—one in the shape of a toy train, the other shaped like a dancing doll. Later that night, I shared my epiphany with my husband, who understood—about my dad, about the birds, about my wish to share it all with our kids. Let’s get a tree, he said. We’ll do this. And from that year on, we did. Christmas—in our modified, Rosenberg kind of way. *In truth, the two components of my ethnic identity have never felt mutually exclusive to me. But as a social work grad student, for whom the topic of racial identity came up in class just about every day, I kept finding myself in a position of having to explain and frequently defend who I was. How can you be black and Jewish? If you claim Jewishness, aren’t you also claiming whiteness and rejecting your blackness? If your Jewish Grandmother rejected you, how can you in any way identify with her culture? And so on. It is one thing to know who you are inside, but another to be put on the spot to explain it every day. I did not always have the right words ready to defend myself. Why bother? To whom did I owe an explanation? Ultimately, to no one but myself. This entry was posted in Childhood in America, Cultural Context, Loss, Multicultural Parenting and tagged Christmas, families, Hanukkah, Jewishness, Shopping Mall. Bookmark the permalink. Your sensitive writing keeps the past, and your father vividly alive in beautiful and richly detailed prose. Lovely touching memory, Lisa. Ironically my 85 yr. old father at this time, is close to death in palliative care unit at a major hospital for nearly past 2 wks. He has cancer and past 6 years his quality of life very high until Sept. when chemotherapy was administered for the lst time. My siblings who live in the same city (I live over 3,000 km. west), need to now count his breathing gaps…a clear indication of his last grasp of life. I don’t mind a bit of decorative Christmas commercialism that one sees in the shopping malls. It does look festive with colours and lights. That is the spirit…light in the darkness of cold night. I just wish we give my father the light that he needs now. Jean, I am so sorry to hear about your father. It is so hard to see someone you love so much suffering with the pain of cancer. Sending you hugs and hope and love during this hard time.